Roman Yampolskiy ’04 (computer science) was one of three “difference makers” in the Artificial Intelligence community who spoke to students, faculty and staff about the future of AI as part of RIT’s Move78 retreat. The associate professor of computer engineering and computer science at the University of Louisville is one of the top researchers in AI safety and cybersecurity. As a result of the retreat, RIT will begin a follow up seminar series on March 27. RIT has a growing artificial intelligence (AI) community, and a new seminar series has been developed to strengthen interactions among researchers from across campus involved in the growing technology field. The series begins Monday, March 27, and runs successive Mondays through the remainder of the academic year. All sessions take place at noon to 1 p.m. in the Campus Center Bamboo Room. The new series came about as a result of a recent campus event, the Move78 Retreat, which brought together individuals from multiple RIT colleges involved in AI coursework and research. This follow up series will focus on machine learning, neuromorphic computing, computer vision and other related topics. It is open to faculty and staff retreat participants and those interested in learning more about AI research underway. At RIT, there are 43 separate AI-focused courses and approximately 40 faculty-researchers in 27 lab groups across campus involved in work using AI and other related topical areas. Examples of courses include Deep Learning for Vision, Machine Intelligence, Brain-inspired Computing and Big Data Analytics. Faculty in the Kate Gleason College of Engineering, B. Thomas Golisano College of Computing and Information Sciences, Saunders College of Business, the College of Science and the College of Liberal Arts are looking to develop an organizational structure that encourages cross-college and corporate collaborations in AI and cognitive technologies. 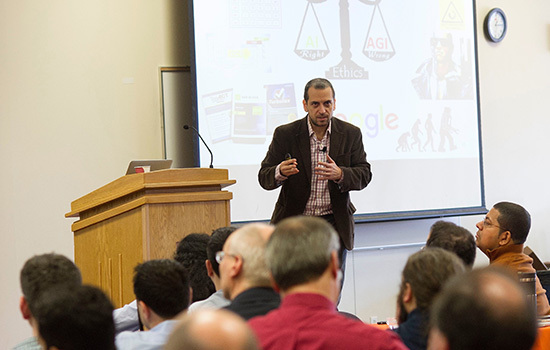 During the retreat, which took place in mid-February, more than 200 faculty, students and staff members teaching or researching artificial intelligence systems participated. Organized by RIT Provost Jeremy Haefner and several faculty, the retreat was an opportunity to learn more about the field, current AI work being conducted at RIT and the direction the university might take to expand its capabilities. The day-long event combined presentations, poster sessions detailing RIT research and closed with a series of focus groups to develop next steps toward meeting the goals the campus team outlined. AI is defined as the capability of machines to emulate human intelligence and is an interdisciplinary areas of research. Some of the developments in cognitive technologies were discussed by three “difference makers” in the field today, including opening speaker Massimiliano Versace, founder of the Boston University Neuromorphics Lab. “This is the right time to go all in. It is not going away,” said Versace, who is also co-founder of the company Neurala Inc. He pioneered much of the brain-inspired computing technology and has incorporated applications into robotics. While robotics is evolving, he detailed three trends that have to happen almost simultaneously to propel AI further: the algorithms necessary for complex computing processes; advances in internal computing power; and equipment such as accelerometers, gyroscopes and high-tech sensors. Much of the research today is in correlating the functions of the human brain as an inspiration or map for computing systems. “The brain is the most sophisticated equipment made today,” he said. Bo Ewald, president of D-Wave International, gave an introduction to quantum computing, a next-generation system with high expectations of greater processing power. He expects that quantum computers could process data 10,000 times faster than traditional computers and can map a machine-learning process into its capacity. “This is the computing of tomorrow, but what we need are people to address the applications where the technology could be used and people to build the software tools for the computers,” he said. Roman Yampolskiy ’04 (computer science), an associate professor of computer engineering in the Speed School of Engineering at the University of Louisville, discussed building ethical practices into the technology. He leads the university’s Cyber Security Lab and focused on the implications for security in AI and how it must be embedded into the development process. The retreat was titled “Move78” by Haefner and is a reference to a best-of-five game of Go, the Asian board game of strategy, between a Google’s computer system Alpha Go and Lee Sedol, one of the top Go players. Over several series of games and complex moves, the computer bested Sedol by “learning” and anticipating moves. The encounter raised questions about the potential of AI and how humans will rise to the challenge. It also raised questions about RIT’s role in these challenges. “It forces the human race to be better than it is; it is challenging us to be better humans, and that is the most exciting thing about today,” said Haefner. Move78 committee members are Dhireesha Kudithipudi, chairperson: Edward Brown and Ray Ptucha, faculty in the Kate Gleason College of Engineering; Cecilia Oversdottor Alm, from the College of Liberal Arts; Chris Kanan, from the College of Science; J. Fernando Naveda, from Academic Affairs; and Leonid Reznik, Carol Romanowski and Richard Zanibbi, faculty in the B. Thomas Golisano College of Computing and Information Sciences. More information about the retreat can be found on the provost’s blog: https://www.rit.edu/academicaffairs/blog/2211.